The next big life changing advancement in modern society must be the self-driving car. When I was growing up I thought cars would fly but that practicality has never materialized. The idea that a car could drive itself is even now at this moment something many may scoff at. Except the technology is already here. Cars are on the road driving themselves based on destination information provided by a user. The technology is being integrated into production cars at a fast pace. In production now are cars that will stop on their own to prevent a crash, cars that will parallel park themselves, and cars that auto pilot once on the interstate. This technology is a game changer. A car could be ordered and it would arrive at your location without the need for a driver to bring it. The application of the technology in long haul trucking or other businesses is far reaching. Proponents claim that computers will be safer than human drivers and that may well be the case at some point however self-driving cars will still never be perfect. There have been deaths in the past due to errors in the computer programming and there will be deaths in the future. However, what is more interesting about this technology is that developers will need to make ethical choices in the computer logic. They have programmed the car in the right situations to crash endangering the driver verses a crash that might hit something else. Self-Driving cars will never be perfect. They will always fall short of being perfectly safe. Just like the self-driving car that will never be perfect we are not perfect. We fall short before God’s perfect expectations. It is a sad state that is hard accept. All have sinned. All are broken. All fail. All are second place. There is no way that we can be perfectly safe any more than 100 years of self-driving cars can be programmed to be 100% safe. But God is better than the best programmers. Programmers are stuck working with the laws of physics and limited knowledge of what other cars or people are doing. So they must write code that could decide death for the passenger. God does not need to deal with the ethics of programming failure. God is literal perfection and his solutions will always be perfect. He knows all things so there are no surprises that he must account for. So what is the solution? How does God break out of our earthly failure to give us heavenly perfection? 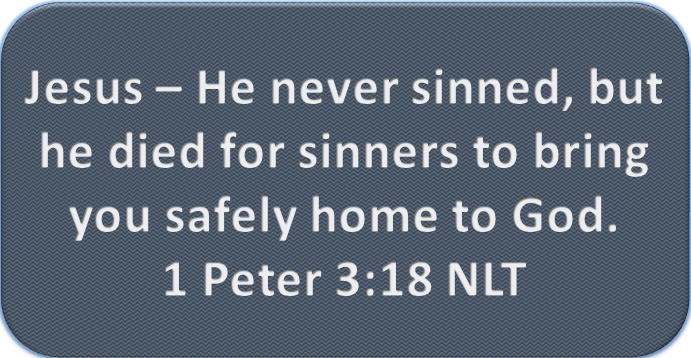 God’s solution, his heavenly perfect solution, is to save people apart of the laws that highlight our failures. No longer is second place a problem. No longer is my brokenness a hinderance. My sins are no longer held against me. God has made me right when I placed my faith in Jesus Christ. It is not works, privilege, power, money, or family. Faith in Christ is freely available to all no matter where or in what time. Some people seem to have a perfect life. Everything they touch turns to gold. Tom Brady, quarterback of the New England Patriots, comes to mind. He has a perfect family. Financial independence. As close to perfection as one can be on the football field. He is a winner. I wonder sometimes how it is even possible to be that successful. Tom Brady has mastered the perfect media persona and there are many people who want to emulate that packaged presentation. Even everyday people like me post the best photos and highlight the events we want everyone to see. The problem with our media selves is that it is almost all fake and illusion. We present only a cherry-picked view or highlight of life. Our poor youth think that these lives online are real and then they are devastated when they can’t live up to the unrealistic expectations. Even Tom Brady is not perfect and has issues and burdens he must carry. I have observed teens absolutely melt down because of social media posts that were not favorable. The obsession around self-worth found online is more than concerning and impacts our very mental wellbeing. Success is sometimes ascribed to God. In fact, many people do this by saying they are #Blessed because of some earthly success in their lives. If one person has more money than someone else then some believe that God has blessed the person because they have money. Is there any truth to this perspective? Samuel the leader of Israel is one of those blessed people. He is blessed by God from the very start of his life. Further once Samuel came into power the Bible states that the “hand of the Lord” was actively engaged to support the hot political agenda of that day in Samuel’s favor. Even further God picked sides and lifted Samuel up by pushing others down. God did bless Samuel in his professional life as a ruler and priest. We also see this phrase “hand of Lord” in other places throughout the Bible. Of note is the description of the very early church. Here is God’s hand clearly at work and it states that their actions came with success because of God. Now before there is any confusion or taking a truth out of context there is something fundamental we can take away from these instances of God’s blessing on these people. There are two key observations about Samuel and the early church that we must understand before we ascribe #blessings on anyone. First the Lord’s hand is not on just anyone but on people dedicated to Him. Samuel is a priest of Israel. The early church fathers found God’s hand working for them when they were sharing the gospel of good news about Jesus. Samuel’s life was not perfect. Like Eli before him his sons did not follow in ways of the Lord. How painful must that have been to see his children not following God but following their own desires. Obviously, Samuel has serious problems on the home front. Or look at the early church who had the hand of God on their work. That blessing came in the midst of Stephen being killed. These men had fled their home leaving behind material things, family, and community because of Christ. The world that would sign #blessed for YouTube stars would call these followers of Christ losers in life. This brings us to the conclusion that there are two types of blessings. First is the type that Tom Brady clearly has in his life. That is the general blessing of God that is on all people (some more than others). All people are created equal in the image of God but not all people are created equal in opportunity. Success in this life is nice but this kind of success has nothing to do with the blessing of God where it matters and that falls in the second category of blessing. The blessing of God’s outpouring of eternal significance. The Philistines wanted to enslave the Israelites and corrupt them with an unholy culture. Samuel was blessed by God so that the Philistines were unsuccessful for the benefit of the nation of Israel and God’s glory. The early church found success in the murder of Stephen to share the good news of Jesus to the benefit of the church and for God’s glory. Be blessed like Samuel and the Church fathers because their rewards are eternal. Tom Brady’s reward is here and now and will be gone in a season.